Downtown Spokane businesses would get a rebate on security improvements to their properties, including the installation of surveillance cameras, under a measure being considered Monday by the Spokane City Council. The proposal, two years in the making, would encourage property owners to work with the Downtown Spokane Partnership and Spokane police to develop a plan to increase lighting and visibility in an effort to combat crime. A participating business would purchase the cameras or make suggested landscaping and architectural changes, then receive a dollar-for-dollar discount on the annual fee they pay to do business downtown. The plan has the backing of both City Council members representing downtown, as well as the partnership, which collects annual fees totaling more than $1 million to fund services that include street cleaning, event support and security. If the full City Council approves the plan, $26,000 will be made available to downtown property owners to support security efforts. 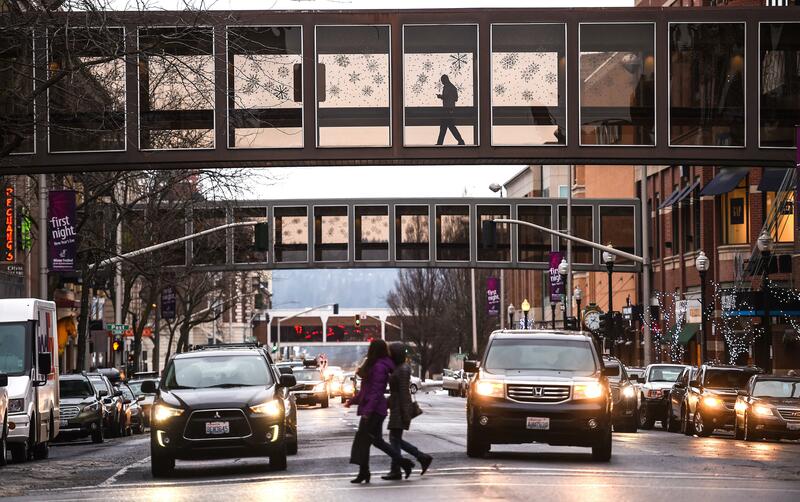 But Spokane City Councilwoman Kate Burke is raising questions about the necessity of more downtown cameras and if that money might be better spent on other efforts to address the perception of downtown as unsafe. Beggs said he didn’t believe the evidence showed that cameras prevented crime, but noted that they would be useful in identifying suspects and aiding investigations when crimes did occur. Both he and City Councilwoman Lori Kinnear said the legislation left the option of what security measures to take up to the property owner themselves. The proposal offers some examples of strategies known as crime prevention through environmental design (CPTED) techniques that either the Downtown Spokane Partnership or Spokane police could provide to a property owner seeking assistance. One of two certified downtown ambassadors from the partnership, or a police officer, would provide options that the owner could choose from for reimbursement after an on-site visit. Suggestions include more lighting in cavernous entryways, trimming landscaping to improve sightlines, and cameras. Burke said she believed the legislation was designed with increasing downtown cameras in mind, noting that DSP initially approached the city two years ago with a plan to set aside money specifically for cameras. Under a city ordinance passed in 2013 as drone technology began to rise in popularity, the City Council must approve any surveillance equipment bought by a city department or agency, but not private citizens. Cameras are an accepted feature of the environmental design philosophy, Richard said. He acknowledged that DSP supported the installation of cameras, and he personally would like to see more synergy between police and private property owners on the availability of surveillance footage. Cameras also are in the pockets of every downtown visitor with a smartphone, Kinnear said. City Councilman Mike Fagan, who has criticized the city’s use of speed cameras in school zones, said the program was worth a try downtown, given the concerns about criminal behavior. Several private buildings downtown already feature cameras. Dru Hieber, owner of several pieces of property along what’s known as the Bennett Block and the Parkade, has installed additional lighting and cameras on her properties, she said. Betsy Cowles, chairman of the Cowles Co. that owns River Park Square and The M Apartments, among many downtown real estate holdings, said its properties have had lights and cameras for years. Other properties are just starting to adopt exterior lighting and security improvements. Paul Mann, a managing partner in the redevelopment of the Ridpath for apartments, said he recently met with Richard and police about increasing visibility outside of the historic hotel to deter crime. The Ridpath received assistance from the city when it was designated “a project of citywide significance,” Mann said. A portion of the roughly $107,000 the redevelopment received through the city program, which is funded through cash made available through the refinancing of city bonds in 2017, is dedicated to exterior lighting, Mann said, but could not be used for cameras. John Waite, owner of Auntie’s Bookstore and Merlyn’s Comic Books and More on Main Avenue, just bought a video alarm system for his comic book business. He said he would have taken advantage of the rebate program had it been available. “We need all the help we can get in downtown,” Waite said. He said that $26,000 figure would have to be larger in subsequent years because of the cost of camera equipment. Downtown boosters and business owners pushed back on the perception of downtown as dangerous, and actual crime statistics support that finding. The police department’s CompStat reports, comparisons of reported crimes to historical data, show that property crime reports in the downtown core are down 23 percent this year compared to last year, fueled in large part by a drop in theft. Spokane did just experience a historically cold and snowy February, however, which can have a chilling effect on crime. Reports of downtown malicious mischief, which incorporate graffiti, broken windows and any other destruction of property, are also down this year compared to 2017 and 2018, according to numbers provided by the police department. Through the first three months of the past two years, reports of malicious mischief totaled 101 and 146, respectively. This year, there had been 60 such reports through March 16. That’s evidence the money property owners plan to spend on lights and cameras might be better spent on housing assistance, said Jennessa Magner, who said she has been couch-surfing for the past several months while helping clean units for other people receiving homeless assistance, and was sitting last week with a group of people outside The City Gate service center on Madison Street. That includes supporting housing and buying cleaning and sanitary products for those seeking to transition out of homelessness, Magner said. But Suzann Calvert said more cameras and lights would be a welcome addition downtown. Calvert was nursing a broken arm outside the House of Charity homeless shelter Friday afternoon, an injury she said was sustained in an assault that could have been prevented by better visibility near the shelter. Beggs and Richard said the installation of cameras would not mean the type of round-the-clock surveillance that has caused concern in cities including Seattle and Chicago about the intersection of public safety and civil liberties. If police wanted access to camera footage, they still would have to request it from the property owner, or seek a warrant to compel someone to hand it over. Hieber said that cameras and additional security should not be seen as a panacea. While she’s added those features to her buildings downtown, she said calls for backup from Spokane police often go unanswered. “Why invest in it unless the city will invest in the police to do the work that needs to be done to make our city safer?” Hieber said. The Spokane City Council is scheduled to vote on the measure at its weekly meeting, Monday at 6 p.m. at Spokane City Hall, 808 W. Spokane Falls Blvd. Published: March 24, 2019, 5 a.m.